Join us for an exclusive presentation by Girish Patangay from Velocity 2013 conference. Facebook's large user base has no idea the website is changing under their feet. 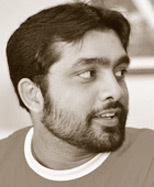 This talk by Girish Patangay will focus on Facebook's operational and release processes that are very unique to such a large website. Girish will be walking through a typical change from inception to the final deployment into production. Facebook uses a combination of tools and culture to help scale this process to over a thousand engineers and tens of thousands of servers with a very small team of release engineers. Girish Patangay will be taking your questions live in the group chat at 1:00PM PT / 4:00 PM ET so bring your questions. Girish has been with Facebook since early 2008 working the on Technical Operations and Infrastructure teams. Having been the only release tools engineer for over two years where the site grew over 10x, Girish has had to use every trick in the book to keep up with the growth of infrastructure as well as number of developers. Today, Girish works out of Facebook's London engineering office and leads the tools team.